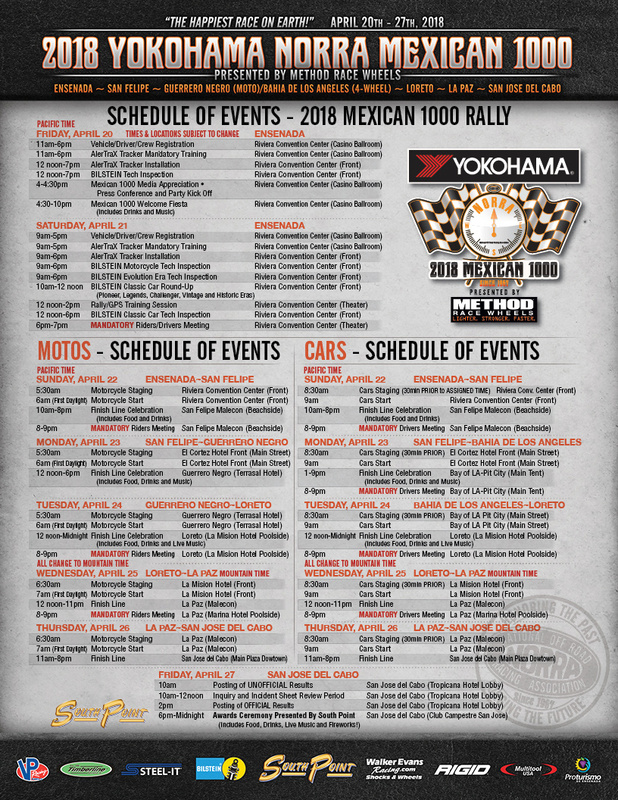 March 28, 2018 (Agua Dulce, Calif.): Event organizers for the 2018 YOKOHAMA NORRA Mexican 1000 will be the first to tell you – putting together the logistics for a five day 1,300-plus mile romp through Mexico’s Baja peninsula is never easy. There are myriad of details to confirm, crews to assemble and a sombrero full of details to finalize. The 2018 NORRA Mexican 1000 is supported by Yokohama, Method Race Wheels, Walker Evans Racing, South Point Hotel Casino, Bilstein Shock Absorbers, Multitool USA, Mastercraft/Impact Safety, P.C.I. Race Radios, Cerveceria Transpeninsular, VP Racing Fuels, Steel-It, Ensenada Proturismo and many more.